The compact organizer opens totally flat, making it much easier to note down appointments. The ring has 20% less height, making it easier to fit inside a smaller bag. The outer jacket is made of solid material instead of the traditional foam-filled organizer. The organizer comes with a calendar filler: 1 week on 2 pages. 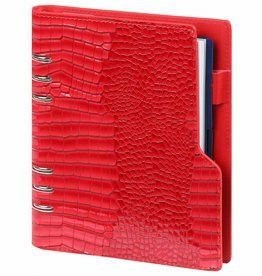 The organizer features 5 tabs, a page separator and an address book. The organizer contains ample room for personal information, calendars and planners. Apart from all the practical advantages, it is simply a stunning design. Outside dimension organizer: 230 x 180 x 26 mm. Personal paper size in calendar: 210 x 145 mm.